Sometimes you just want to buy a decent, affordable bottle of wine without having to know anything about tannins or smokey overtones. An iPad kiosk called VineSleuth wants to help. When it arrives in grocery store aisles next year, you'll be able to press a button and say what you want in your own words. "I'd like a cheap rosé that's not too sweet to go with a Caesar salad." Sounds simple enough, but understanding natural spoken language, picking out keywords and using them to identify specific wines is complicated. And VineSleuth is a small startup with only one full-time employee. The company's founder, Amy Gross, is borrowing some of the most powerful technology from IBM's artificial intelligence product Watson. Artificial intelligence is increasingly important to consumer technology. Google (GOOG), Facebook (FB) and Microsoft (MSFT) all have dedicated teams working on AI. They've hired some of the best minds in the field and have plenty of money to fund groundbreaking research. The fruits of their efforts are already visible in tools like Siri and Google Photos. Scrappy startups like VineSleuth don't have access to world famous AI researchers or labs. But IBM makes its own tools available to companies in the form of APIs -- tools developers can use to integrate Watson's powers with their own software and apps. Watson became famous in 2011 when it beat human players on Jeopardy. It was fun and made headlines, but it was also the beginning of a serious business venture for IBM (IBM). Now the company makes money off of Watson by selling it to businesses and making its features available to smaller companies like VineSlueth. Elemental Path built an educational toy dinosaur that can answer kids' questions. A tool called Sellpoints uses Watson to learn more about an individual's shopping habits so big companies can target them for ads. There are dozens of APIs for image recognition, building customer personality profiles and answering spoken questions. 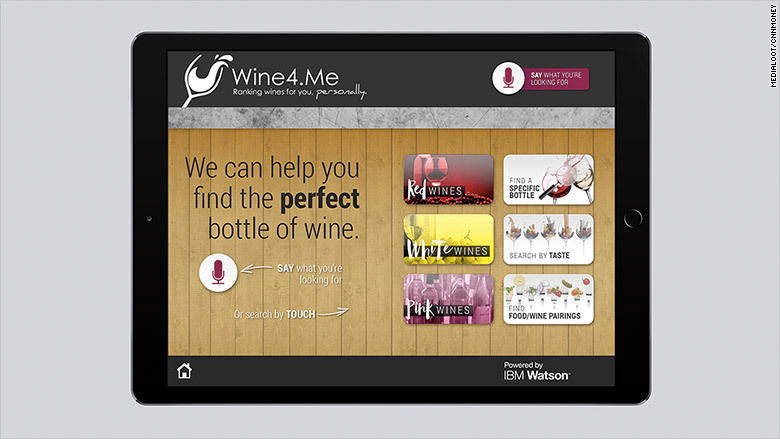 As part of its startup program, IBM doesn't charge partners upfront to use Watson. Instead it gets a piece of the eventual revenue, though IBM declined to say what the terms are. The company recently opened a new Watson office in San Francisco's SOMA district to attract even more startups. Currently, more than 350 startups and commercial companies are using Watson's APIs. "Working with Watson gives us a whole other level of credibility than we would have on our own as a startup," said Gross.